Starbucks has done it once again! The beloved coffee brand proved to be nothing but great as they released new beverages and food items that is perfect for every coffee lover’s palette. With Starbucks’ continuous growth, I’m sure most of us can identify a branch or two, especially if you’re near the busy business districts. 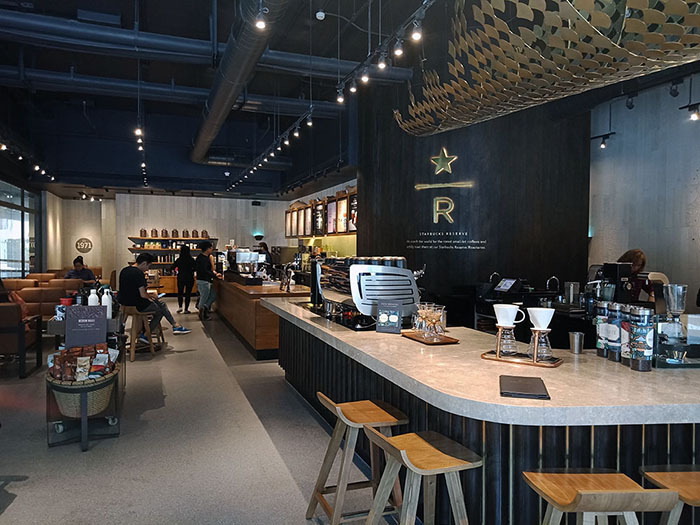 What is not commonly known, however, is the existence of Starbucks Reserve branches. What set these Reserves apart from the regular branches are the more sophisticated interiors and minimalist layout that make use of wood, marble and ceramic materials. Aside from the physical differences, the Reserve branches are also proud of the premium selection of beverage and food items that are limited only to them. There are currently 11 Reserve branches in the Philippines, and each store has a unique line up of goodies that they offer, so while you can always order your regular go-to Frappuccino or take comfort in your Starbucks Signature Hot Chocolate, it wouldn’t hurt to be adventurous and give your taste buds a new breed of flavors through the Reserve specialties and limited offers. A media session was conducted on September at the Starbucks Reserve Stratosphere in Valero, Makati City. 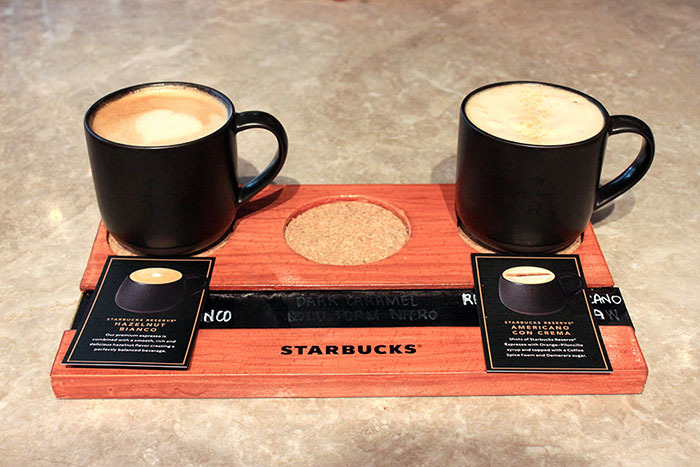 The invited guests had the chance to go into a coffee journey as Starbucks conducted its first ever coffee flight. If you’re familiar with a wine or beer flight wherein you get to sample the beverages in levels and differentiate its taste, texture and intensity, a coffee flight is similar. The flight consists of three levels—each featuring a new item to the beverage selection of Starbucks. 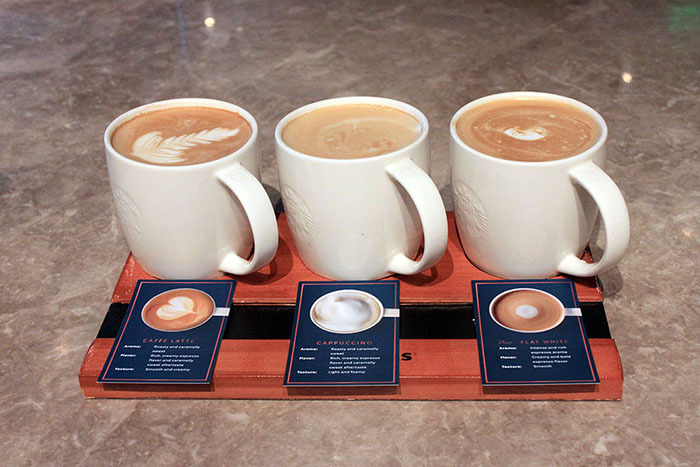 The first flight consists of the classic café latte, cappuccino and the newly released flat white. All three are labeled as core espresso beverages, and are made using the Black Eagle espresso machine, which is only available in three out of the 11 Reserve branches in the Philippines—Podium in Mandaluyong City, Powerplant Mall in Rockwell and Stratosphere in Makati City—and is described by 2018 Starbucks Philippines Coffee Ambassador Steaven Bueno as the “perfect machine” and is the “best of the best”. Going back to our flight, both easy-to-drink café latte and cappuccino uses the same ingredients and method of preparation, but the later gives us more foam and is creamier compared to the rich and smooth texture of the café latte. Meanwhile, the flat white broke all my first impressions of a flat white. I’ve only ever heard my aunt and uncle order flat white wherever we go, but I don’t have any recollection of actually tasting one because I originally thought that it was more of a milky type of coffee (obviously, I had a different connotation of its name). However, when I got to taste Starbucks’ flat white, all of my impressions were nullified because it actually has a deeper espresso taste than the first two drinks. Steave, having served as our barista for the day, explained that in making flat white, the coffee beans have a shorter contact time with water, resulting to a stronger espresso flavor. I’d say that this flat white is definitely something definitely worth trying—it might even be added to the staples list of every coffee lover! 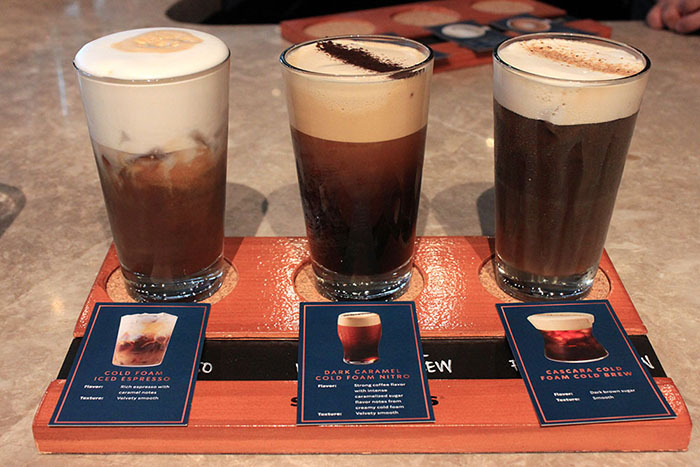 The second flight introduces Starbucks’ cold foam in cold brew specials. As a precursor, even though this set of beverages are served iced—or cold, to be more accurate—we weren’t given any straw to sip the drinks, and no, it’s not because of the Makati City ordinance. To get the whole cold foam experience, you’ve got to drink it straight from the glass because when you drink with straw, you’ll hit the bottom most part immediately and all foam will be left behind. With that being said, let’s go to the first drink of our second flight—the Cold Foam Iced Espresso. Drown in the foamy goodness of this beverage that literally makes you experience a journey of growth as it progresses from milky foam to bitter coffee in just a sip. Anyone who dares to drink this with a straw will definitely have regrets because you won’t be able to experience the baby-like treatment of having to drink the foam first that is like preparing you for the real world, which is coffee. The Dark Caramel Cold Foam Nitro, on the other hand, will make you say, “Foam pa lang, complete drink na!” You’ll definitely enjoy this drink starting from the flavorful caramel foam until the last drop of your cold brew. This drink is made without ice and uses nitrogen gas as a substitute, meaning your coffee won’t be diluted in comparison to when ice is used; hence, giving you a more rich coffee taste that is refreshing enough even without actual ice. Finally, the Cascara Cold Foam Brew uses brown refined but less processed sugar, so it’s a lot healthier. The use of brown sugar gave a balance of bitterness and sweetness in the drink. 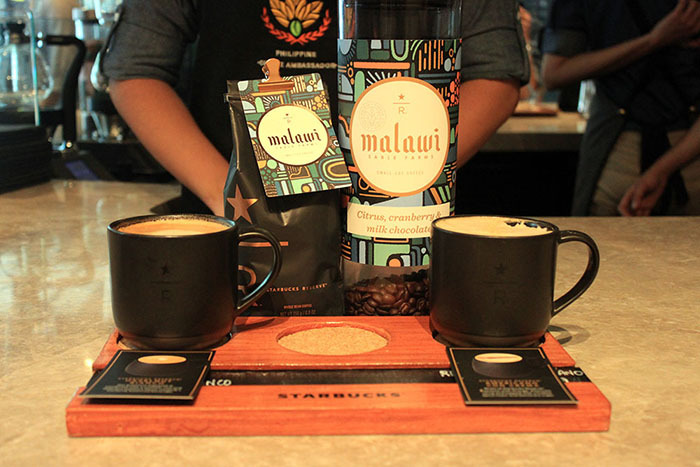 For our last flight, Starbucks reveals the limited edition Reserve featured drinks, which uses the Malawi Sable Farm coffee beans, a special Reserve coffee sourced from East Africa and has a deep roast flavor and aroma, and has hints of citrus flavors. These are the Hazelnut Bianco and the Americano con Crema. The former is a surprising drink that brought home the top drink award for that day. The Hazelnut Bianco highly resembles the nutty goodness of the famous Ferrero chocolate and left a smile on everybody’s faces, especially those of us whose favorite chocolate is Ferrero. Meanwhile, American con Crema, made up of Orange Piloncillo syrup, coffee spice foam and Demarara sugar, has a rich and creamy espresso roast with hints of spices that remind you of autumn flavors. 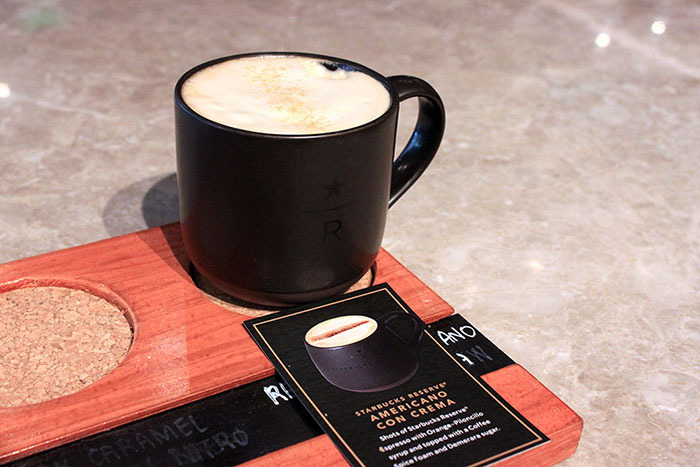 Aside from beverages, new food items are also available as Starbucks Reserve introduces a new addition to their menu—soups. Soups may seem light for the stomach—especially a hungry stomach—but it is actually filling and can stand as a meal on its own, especially Starbucks’ own rendition of Mushroom Soup and Apple Pumpkin Soup. The mushroom soups that are available out there are usually watery and just bits and pieces of actual mushrooms are dumped in there, but this mushroom soup surely one because of the creamy goodness and mushroom pieces that you’ll get every scoop of the way. Meanwhile, the Apple Pumpkin Soup is also very thick and creamy and is bursting with flavors—from mild pumpkin to playful spices. Who can refuse pastries and desserts, especially when Starbucks just added heaps on their already sumptuous stash? Enjoy your afternoon coffee or tea with a bite of Palmier or Kouign Amann, both are French puff pastries with certain distinctions in shape and preparation, and cap it off with a sweet chocolate bark available in both milk and dark chocolate flavors.